While promotional pens are often a go to for many business, it is not often businesses turn to luxury pen brands to help promote their business. Luxury pens, while often expensive, bring a touch of class and style to your brand, and for those working in the corporate field, they can be a great way to promote your business and your brand to high end clients, as well as the perfect gift for long term staff or to celebrate a promotion. The Waterman pen range is well known for style, luxury and class with classical qualities making it a great branded pen. The Waterman Perspective Ballpoint Pen range carries these features and is a great exclusive and professional corporate gift. There are three variations in the Waterman Perspective Ballpoint pen range – silver and black, gold and black and silver and blue; all carry the same style and class you expect from the Waterman range. These promotional pens can be engraved in gold for a personal touch, or can be printed with your logo and branding. With a 40mm x 7mm space, you have plenty of room for your business name or message. The Waterman Perspective Ballpoint Pens are a twist action retractable pen featuring the smoothest blue ink. 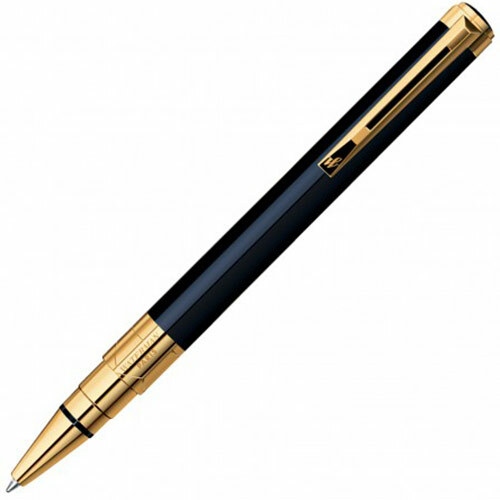 Classic in style, they will certainly make an impression with anyone who receives this branded pen. While the Waterman Perspective promotional pen is in the more expensive range, these pens are well made and of good quality – you can expect them to last and to continue to promote your brand for a long time to come. If your business is after the ultimate is stylish promotional pens, the Waterman Perspective Ballpoint Pen ranks high on the list.